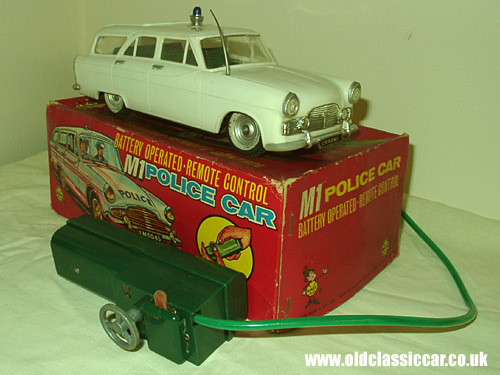 This is another old toy car from Alan's collection, this particular Marx toy based on the estate version of the Mk2 Ford Zephyr from the early 1960s. "A MK2 Zephyr estate [Farnham or Abbott?] usually in white with dark green interior, although there may have been a red Fire Chief's version. It was available both as a friction powered car or as here, battery powered, with steerable wheels. It measures 23cm long by 9cm wide and with whitewall tyres. This one I picked up boxed but not working for £7.50, and have repaired it. Usually missing the aerial and, as on this one, the 'POLICE' transfer from across the bonnet. There is also some chrome loss on bumper corners."